Ferdinand von Rayski (1806 - 1890) was a German painter noted for his portraits. Rayski was born in 1806 in Pegau. From 1816 to 1821 he studied drawing under Traugott Faber at the Freimaurerinstitut in Dresden and from 1823 to 1825 studied at Kunstakademie in Desseldorf. He began his career as a professional artist in 1829, painting portraits of his noble relatives in Hannover and Silesia. 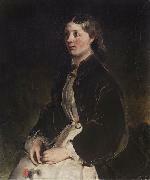 From 1831 to 1834 he lived in Dresden, where he received numerous portrait commissions. He traveled to Paris in 1834-35, and was influenced by the works of Delacroix, Gericault and Gros. Rayski gained a reputation as a distinguished portrait painter, but also produced animal and hunting scenes, as well as, yet less frequently, military, historical and mythological paintings. He lived in Dresden from 1840 until his death in 1890.